United Kingdom and certain other ‘Red Flag State’ vessels carrying people and / or cargo should be certificated under The Merchant Shipping (Vessels in Commercial Use for Sport or Pleasure) Regulations 1993. The system is regulated by the MCA – the Maritime and Coastguard Agency, part of the UK Department of Transport, Local Government and the Regions for vessels in commercial use, up to 24 metres (loadline) length, and which operate carrying no more than 12 passengers. The codes which we predominantly use are. The Motor Vessel Code for vessels up to 24m loadline length (the Yellow Code). The Sailing Vessel Code for vessels up to 24m loadline length (the Blue Code). The harmonised code soon expected to become law. The various Codes have now been integrated and a new fully harmonised code which is not as yet law. The old codes can therefore still be implemented. In addition to vessels that are required to be coded for commercial purposes, some Owners may elect to have their boat coded for tax purposes. 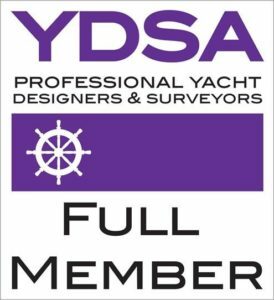 Jayson Sibley is an Accredited Surveyor Member and a level 1 Nominated Surveyor of the YDSA Certifying Authority and the RYA. He is authorised to carry out Compliance Examinations on behalf of the MCA to enable vessels to be certificated under the MCA Codes of Compliance for Small Commercial Vessels up to 24m load line length. Vessels in all categories (0-6 as applicable to location) can to be certificated. We have successfully certificated in excess of some 200 yachts in various areas of Spain. We provide a full consultancy service for owners to assist them through the process of making their vessel compliant. We will then carry out a full Compliance Examination of the vessel and her equipment, including inclining experiments and collating stability data, completing all the necessary documentation for submission to the MCA Certifying Authority. Throughout the process we are available by email at any time to help and advise on all aspects of getting your boat complaint. Jayson Sibley is also able to carry out Tonnage Measurement Surveys, which consist of a short assessment whereby a number of specific measurements and registration details of your particular vessel are recorded to enable us to make tonnage calculations. This data is then used to complete a Tonnage Measurement Certificate, which along with other documentation is used to obtain Part I British registration. The main reason for registering a ship has always been to prove its nationality and as proof of title. For Merchant/ Pleasure ships Part I British registration is essential for overseas voyages. Another reason for Part I British registration is to use the ship as security to obtain a marine mortgage which in turn is registered. Purchasers of UK registered ships can obtain a Transcript of Registry, which shows the registered owners of a ship and whether there are any outstanding Mortgages recorded against that vessel. Registered office : Apdo de Correos 206, Alcudia, 07400, Mallorca, Spain. Copyright © 2019	Jayson Sibley Adjusters. All rights reserved.